Colifast ALARM ™ is an electronic instrument for detecting indicator bacteria in drinking water using patented Colifast technology. 100 ml water samples are automatically collected at programmed intervals and analyzed for total coliforms, thermotolerant coliform bacteria or E. coli. 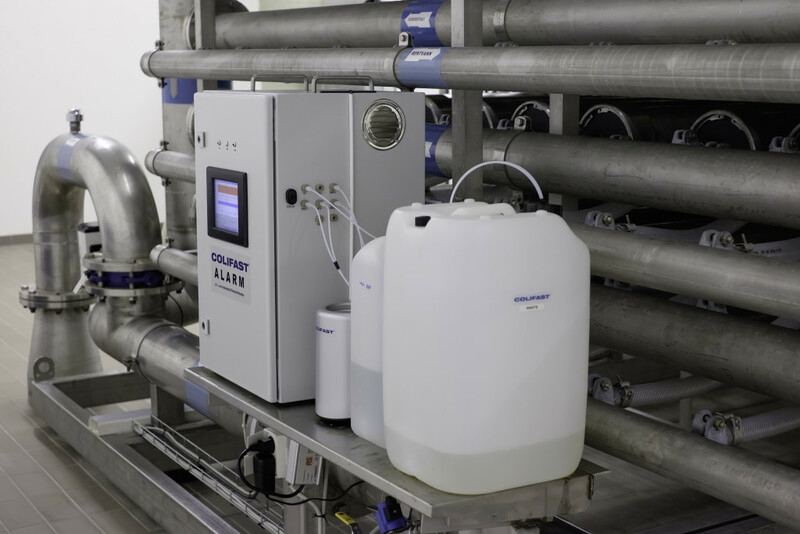 In addition to performing rapid, online microbial water analysis, Colifast ALARM measures water turbidity. The system can automatically send results to control rooms / operators via LAN, digital signals or via mobile networks (SMS). The system can detect down to 1 cfu / 100 mL, and results are achieved within 6-14 / 15 hours. The main components of Colifast ALARM are the incubator chamber, an injection pump system for fluid handling, and a detector system that includes wavelength-specific emitters combined with a spectrometer. Detection of down to 1 viable target bacteria is based on bacterial growth, group-specific enzyme activity and measured concentrations of a fluorescent product (ppb MU). An increase in the number of target bacteria means an increase in the amount of β-D-glucuronidase (E. coli-specific enzyme). The enzyme hydrolyses the growth medium substrate to MU (the fluorescent product) and β-D-glucuronic acid. Increased MU release gives increased fluorescence signal on the Colifast ALARM. Colifast growth medium contains inhibitors to prevent growth of non-coliforms. 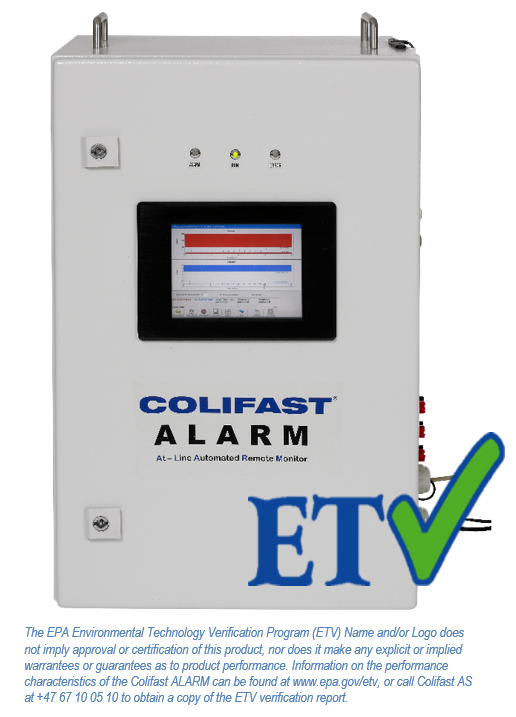 Colifast ALARM is verified by EPA's ETV program.